Google Apps™ brings simple, powerful communication and collaboration tools to organizations of any size—all hosted by Google to streamline setup, minimize maintenance, and reduce IT costs. 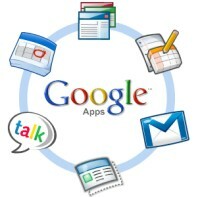 With Gmail, Google Calendar, and integraded IM, users can stay connected and work together with ease. Now, with Halloo for Google Apps, you can finally integrate a business grade phone system directly into your Google Apps account. Google Apps users and groups import directly in to Halloo for the fastest setup of advanced business phone features including toll free number service, hunt group routing, find-me follow-me forwarding, call transfer and conferencing. Up and running in minutes with existing Google Apps users and groups. Toll-free number for big company, professional image. Add voicemail and individual call forwarding to every user in your Google Apps domain. Google Apps groups import directly to Halloo and convert into telephone hunt groups. Single sign-on convenience and direct access from the Gmail menu bar. Find Halloo in the Google Apps Marketplace. Add Halloo to your existing Google Apps account FREE for 30 days. No credit card required.